Yesterday I picked up a nice package from TinyCLR.com. Yes, it is yet another robot (third in fact), but this time it runs .NET! How freaking cool is that! 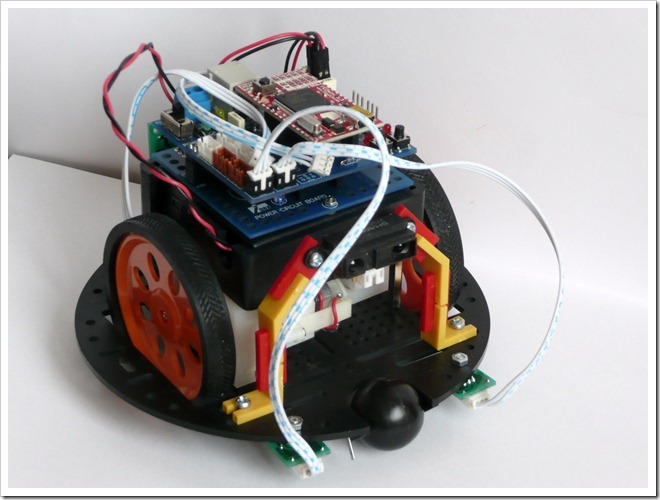 This robot is controlled by FEZ Mini board that runs .NET Micro Framework. What’s interesting is that this board has pin-out compatible with Basic Stamp from Parallax. You can also uses it easily on a breadboard for prototyping (just like Boarduino). TinyCLR.com also offers a larger board called FEZ Domino that has pin-out compatible with Arduino so you can use your existing shields. It is more expensive but notice that this board already includes microSD card reader and USB host connector. Both boards are based on USBizi chipset from GHI Electronics that in turns runs on 72Mhz NXP ARM processor. But the huge thing for me is that I can program this robot in Visual Studio and benefit from all the debugging goodies (breakpoints, variable inspection, stepping, etc.). 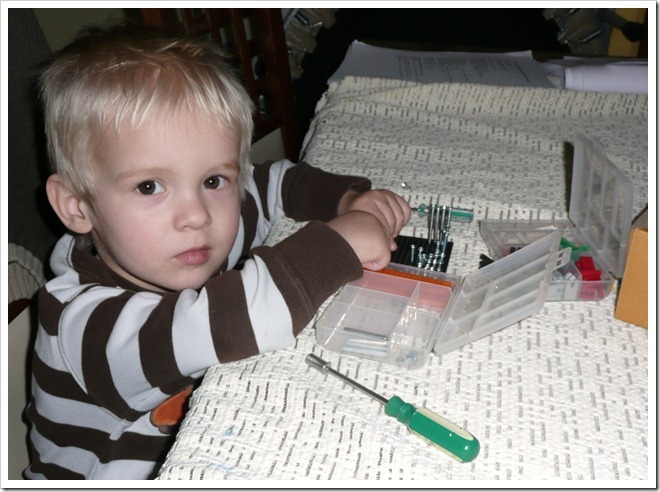 The robot kit itself comes from INEX Robotics – company that makes many interesting educational kits for robotics and electronics. Over there the robot kit is called POP-BOT and only difference is that it is controlled by Arduino compatible board. But you can also download the POP-BOT Manual that has 130 pages of many cool project ideas (line tracking, object avoiding, controlling servo motor, and serial LCD). I’m sure it will be lots of fun converting these projects to .NET Micro Framework. Two reflective sensors are included in the kit (useful for line following and edge detection projects), and you can order additional components both from TinyCLR.com and other robotics sites. 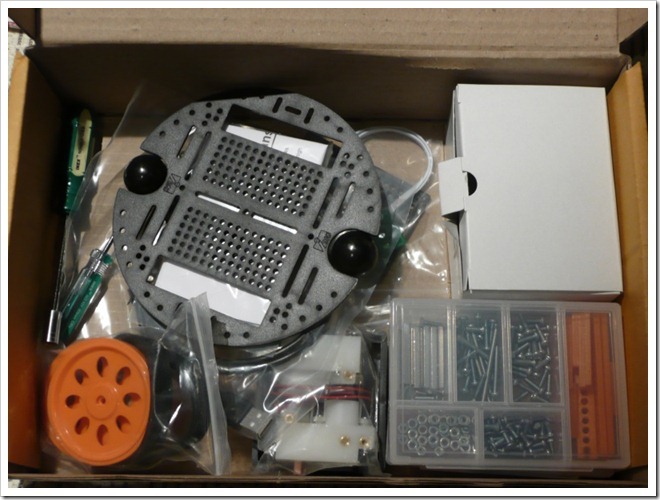 Many construction parts are included in the kit so it is very easy to attach additional sensors or other parts. As you can see on the picture above, I already added a Sharp IR distance sensor in front (so I can teach the robot to not bump on walls). I also added an Xbee expansion board on the back so one day I can control the robot remotely (and my Holy Grail is to connect the robot to Microsoft Robotics Developer Studio). Of course both FEZ Mini and FEZ Domino boards can be used not only for robotics, but also in many different applications. Go to the TinyCLR.com website and check out the Projects tab. For quick introduction to .NET MF you should also download the Beginners Guide to C# and .NET Micro Framework, free ebook from Gus Issa. In my previous post I complained how upset I’m that there is no cheap .NET Micro Framework hardware for hobbyists. Now I can take it back. IMHO we finally have a very powerful alternative to Arduino and similar platforms, with the price that won’t break the bank (especially with FEZ Mini). I come across your blog while searching for how to work with this kit, I bought the same kit, read the manual and assembled it. the problem I ran into is it doesnt run, I dont know what happening, i used 4xAA rechargible (2000 mAH by sanyo). I turn on power switch LED on and everything but it behave pretty unpredictable when press one of those buttons (reset, Di2, Di4) one a while one of th e motor spinning, but most of the time they dont spin. I thought there may be not enough power to spin the wheels, but battery led is off, suggested me that there is enough power to operate the motors? I have not program anything on it yet. do you know what happen?